The new BMW X2 Diesel Hatchback aims to fuse the best of the hatchback world together with the best of the crossover world. It’s handsome, affordable to run, and – as ever with a BMW – great to drive. It’s also got a bit of attitude to go with its billing as a family car. For its size, it’s quick off the mark. It shares its chassis with the BMW X1 Coupe, it’s aimed at younger people who want style – but it’s also a totally brand new model. Have BMW got things right the first time around? BMW started as a company making aircraft engines during World War I. Find out how they went from the air to the road and became one of the most popular cars on UK roads in our brief history of BMW. OSV takes a closer look at what it’s all about with our 2018 BMW X2 Diesel Hatchback review. Cars this size aren’t usually all that agile or responsive, but you can always count on BMW to buck the trend. That’s the case here. 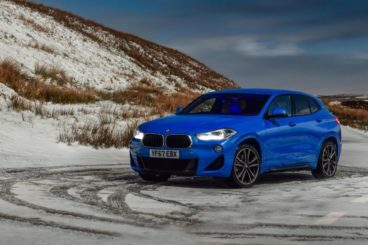 Being based on the X1 Coupe means it handles tidily, while BMW have also stiffened its body and tweaked a few components here to ensure that it offers an engaging and involving driving experience. Enthusiasts will enjoy it, although they’ll enjoy the bigger M Sport variant even more. It sits 10mm lower and has a firmer suspension setup. The standard model itself sits pretty low – lower than the X1 Coupe – and combined with a low driving position, the X2 feels very sporty. Indeed, the car drives like something a lot smaller. The direct steering is fast and accurate, and body lean is minimal. That said, the steering lacks feel. If you like the sound of the M Sport model, it comes with bigger wheels, more grip – but also a bigger price. In terms of its engines, the X2 diesel has just the one. This is a 2.0-litre unit that produces 187bhp, and which can bulldoze its way from rest to 62mph in 7.7 seconds. Four-wheel-drive is standard, and this arms the car with plenty of traction so that it can cope well in poorer conditions. It’s mated to an 8-speed automatic ‘box as standard, which is responsive and smooth. It’s not what you’d call a sporty power plant, but because there is as yet no petrol engine in the range, it’s as sporty as the X2 gets unless you want to pay extra for the M model. Buyers will also have to wait for front-wheel-drive models, too. These will cost less to run than the current diesel on offer, and will also have less power. As long as you avoid the meatier M Sport model, the X2 offers a comfortable ride. It’s got a sporty flavour to it as well. The M Sport, however, finds it harder to smooth out rougher road surfaces. The X2 is a lot of fun on winding country roads, but it also works well as a relaxed cruiser. Insulation isn’t first-class, however, and the big wheels do make some noise. Tyre roar can really test you on longer journeys. In terms of its overall quality, there’s really not much to grumble about here. 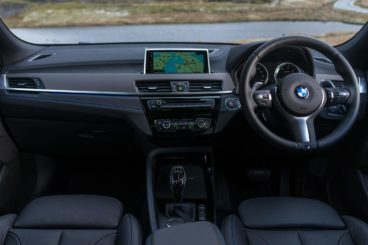 The X2 shares much of its cabin with the X1, which means a smart dashboard and gorgeous seats. The dash itself is driver-focused, with all the controls easy to reach and use. We wouldn’t say that this is the most eye-catching dashboard you’ll ever see, but it’s logical and neat and tidy. The infotainment display is perhaps the most disappointing aspect. It’s not that there’s anything inherently wrong with it, but it looks a tad hastily arranged compared to previous efforts from BMW. Its graphics are nice and clear, though, and you can upgrade from a 6.5” version to an 8.8” version. Is the BMW X2 Diesel Saloon practical? It can accommodate a young family quite well, although adults will struggle to get comfortable in the rear. Access back there isn’t easy thanks to the narrow doors, while legroom is poor. Kids, however, will be perfectly fine. The boot, meanwhile, is a bit smaller than the X1 Coupe and measures 469-litres. A high loading lip will frustrate. How reliable are BMWs? We take a look at the German manufacturer and assess their reliability in our honest review of their cars. Standard kit is great, with the entry-level model coming with sat-nav, a 6.5” infotainment system, alloys, rear parking sensors, cruise control, a digital radio and twin-zone climate control. The Sport model adds 18” alloys, sports front seats, LED headlamps and fog lamps and LED ambient interior lighting. The aggressive M Sport model comes complete with 19” alloys, special upholstery, heated front seats and sports suspension. The M Sport X model rounds things off with aluminium trim for the exterior, leather upholstery and a muscular body kit. Safety-wise, the X2 hasn’t been crash-tested by Euro NCAP, but those same experts are allowing it to share the X1’s 5-star safety rating. Its safety kit includes speed limit warning, auto dipping headlights, lane departure warning and autonomous emergency braking. In terms of its running costs, the X2 isn’t a full-sized SUV, and as a result, it’s a bit more affordable to run. There’s just the one diesel engine available, and it comes with four-wheel drive as standard. Economy is pegged at 60.1mpg on a good day, which compares reasonably with its rivals. However, the Audi A3 – as we’ll see below – is significantly cheaper to run. Still, a BiK rating of 26% is impressive. It’s easy to personalise too so that the car really feels like it’s yours. It’s like a compact large car that puts the fun back into the upmarket family car sector. Its distinctive looks are a large part of its appeal. It’s fine for children back there, but less so for adults. The A3 is much cheaper. Let’s see how the car fares against its rivals in the comparison section of our BMW X2 Diesel Hatchback review. The new Audi A3 might be a bit smaller than the X2, but it’s just as practical and just as easy to recommend. On the road, it’s not as agile as the BMW, or as fun. But it’s comfortable, smooth, quiet and hassle-free. Moreover, all of its engines offer excellent performance and there’s something for everyone. In terms of its engines, the diesel range kicks off with a 1.6-litre unit that develops as much as 109bhp. It can cover the 0-62 sprint in 10.4 seconds and offers a good blend of economy and power. Should you need more performance, a 2.0-litre TDI diesel engine is available in two separate guises. The smaller of the two develops 148bhp and has a 0-62 time of 8.1 seconds if you specify the automatic gearbox, while the bigger of the two develops 181bhp, comes with four-wheel drive as standard, and has a 0-62 time of 6.8 seconds. Running costs? The 1.6-litre diesel is the most frugal, returning 69.9mpg at best while emitting just 106g/km of CO2. That qualifies it for a BiK rating of 23%. The 148bhp 2.0-litre diesel, meanwhile, manages 67.3mpg and also has a BiK rating of 23%. Inside, Audi just don’t do bad interiors, and once again they’ve excelled in this area. 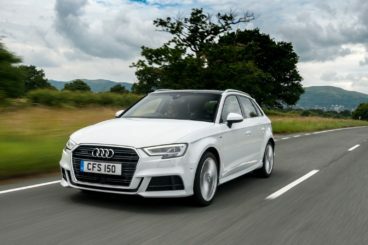 The A3’s cabin is rich in quality, the styling is smart, minimal and tasteful, and the brand’s Virtual Cockpit system impresses us once again. It is, however, available as an optional extra for the entry-level models. That said, even the standard 5.8” colour screen looks fab and it dominates what is a neatly organised dashboard. Opt for the more expensive models and you’ll get treated to lashings of aluminium trim. Is the Audi A3 practical? It’s a roomy car that’s bigger than last time. Two adults can sit in comfort on longer trips in the rear, although three would probably be too cramped. Access is a bit awkward, thanks to how low the car sits, but there are plenty of storage solutions here and there, even if the glovebox probably should be bigger. The boot, meanwhile, is a tad on the small side, measuring 380-litres. Fold the rear seats and you can extend it to 1,220-litres. 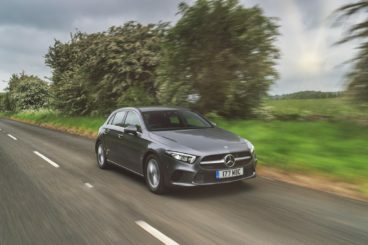 The new Mercedes A-Class is handsome and boasts a class-leading cabin that’s dripping with luxury. It’s not as performance-focused as the BMW, and it’s not as much fun. But if you want an ultra-relaxed way of getting out and about, the A-Class might be the one for you. The steering can be a bit unresponsive at times, but it is at least precise. Moreover, the car is armed with lots of grip, and on the whole, it’s easy to drive. On the motorway is where the A-Class excels. Out here it’s relaxed and refined and works well as a comfortable cruiser. In terms of its engines, there’s just the one diesel available. This is a 1.5-litre unit that powers the A180d model. With a 0-62 time of 10.5 seconds, it’s nowhere near as fast as the BMW, but it does feel quick in everyday situations. For some drivers, that will be good enough. It’s also a refined and smooth engine, although it doesn’t come with four-wheel-drive and sits on relatively small 16” alloys. Running costs? The sole diesel develops a modest 114bhp and is able to return as much as 68.9mpg on a good day. Emissions are pegged at 111g/km of CO2, which gives the car a BiK rating of 24%. Inside, we never expect anything less than a stellar interior from Mercedes, and we’re not disappointed this time around. In fact, buyers will be elated by what they find in this class-leading cabin. It’s at the forefront of tech and design, while quality isn’t half bad either. The dashboard comes with two seven-inch infotainment screens, and you can increase both to 10.25” if you so wish. Because these two screens control so much of the car’s functions, it means that the rest of the dashboard is a clean, fuss-free affair. Is the Mercedes A-Class practical? Passengers in the rear seats get a bit of a bum deal in what is such a luxurious car, and there are cheaper models that will give you more space. Mercedes might tell you that this newest model is bigger than its predecessor – but that really isn’t saying a lot. The boot, meanwhile, is bigger than last time too, but still measures just 370-litres, which makes it the smallest in this review. Not quite a hatchback and not quite an SUV, the X2 is a niche choice. It looks great, handles superbly and offers plenty of pace and power. It’s also got one of the biggest boots in this class. A high price can count against it, but the BMW X2 Diesel Hatchback is affordable to run, and if you want something different this year, it’s well worth a test drive.